When we get 15 minutes, we cover the points below. 1. Even mild corrective feedback comes across as judgment. Some people who receive constructive or negative feedback report feeling “judged,” which leads to defensive reactions. When this happens, the whole purpose of feedback—getting information about performance across to others—is compromised. So, how can we avoid having this happen? How can we stay supportive and constructive even when we are implying that someone has done something wrong and asking them to change? This is no small matter. Effective coaching and performance management pivot from ineffective to effective depending on how well we manage the emotional space surrounding corrective feedback. 2. Why does it feel like judgement? Let’s start by examining why our assessment of someone’s performance might feel like judgment to them. The primary reason we don’t respond well to critical feedback is because it often triggers the primitive part of our brains which reacts to feedback as if it were an attack and triggers defensiveness. Research findings show that criticism shuts down our thinking brain and triggers our primitive brain to react quickly to protect us. When we feel threatened, it is hard to be open to new ideas, feel connected with the person giving the feedback, and value the relationship. 3. What do we need to do to avoid judging? To successfully keep the thinking channel open, we need to collaborate rather than trying to figure out who is right and who is wrong or implying that a person is somehow ineffective. 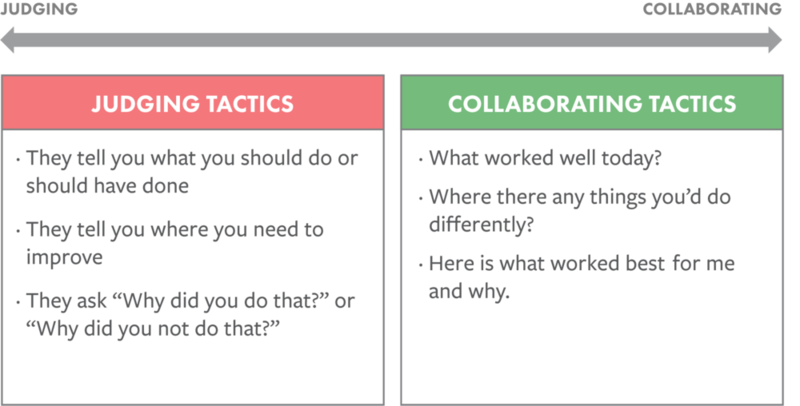 Collaboration requires that the feedback giver and receiver join together to address challenges, understand, listen, and focus on what is working versus what people must do to fix themselves. Research shows that when the giver shows positive regard and focuses on strengths the receiver is less likely to react with flight or fight which can start a debate and destroy productive conversation. When people collaborate, they share their experiences and how each felt about a situation and come to common ground on a path forward: it’s a two-way discussion. The graphic below describes a continuum from judging to collaborating and shows how the giver can can shift the effects of feedback from judging to collaborating. This perspective asks each of us to regulate emotions and the primitive brain, relate to each other as people before giving corrective, constructive, or downright negative feedback. 4. What do I need to learn to get good at this stuff? Consider learning and using what we at Kintla call the Green Zone Sequence, which includes four processes designed to be completed in order: (1) regulate emotions (using top-down, bottom-up and relational regulators), (2) relate to others (e.g. by asking questions, finding out what is happening with them, etc. ), (3) performing the work (i.e. giving the constructive feedback), and (4) sustaining the solution to help it work after the engagement (i.e. providing support and help after the initial message).